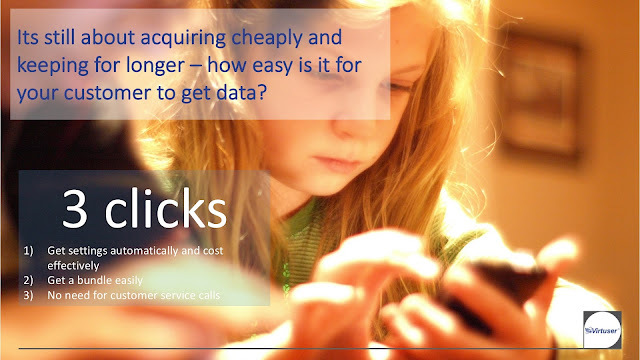 Data is hard for MVNOs to sell effectively, as there are many hurdles, but good loyalty and revenue rewards those that do. The biggest hurdle for any new MVNO is overcoming the same issue of the previous section on marketing: its the schizophrenic frankenstein approach. The reality is that data bundles vary substantially if you are with an MNO, MVNO, prepaid or postpaid, and as such an MVNO data should vary. In reality, most pre-pay and MVNO customer s I have access to data for, use a lot less data than their postpaid counterparts, and there is a reason for this: if you are being charged for more data than you use, you will tend to learn to "abuse" data, whereas is you pay for what you use you tend to be more frugal. The is also a strange dichotomy whereby while mobile data requirements are going up on the one hand, wifi offload, wifi coverage, wifi speed and availability is also going up and giving way to "snacking" whereby frugal, light and moderate use of pay for what you use data at a premium price, can still be cheaper than "supersize" bundles that are throttled at some point anyway. 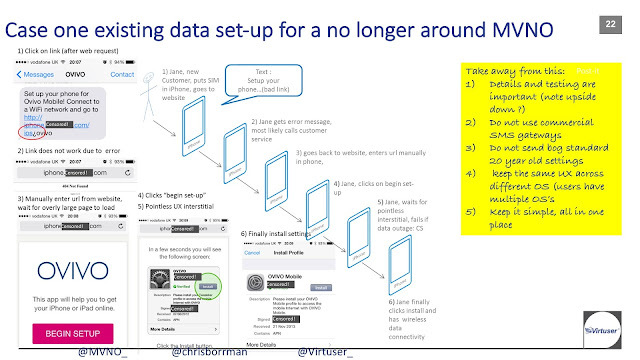 The second big issue for MVNOs is data configuration. 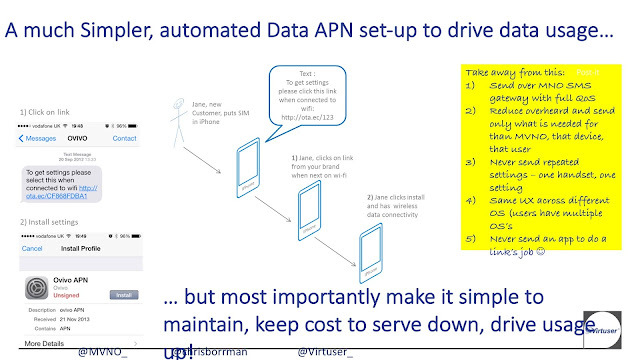 We have been doing OTA APN data configuration specifically for MVNOs longer than anybody at Virtuser and know the pitfalls, especially when i comes to user experience, as we started out enabling apps for Nokia with their PR and Marketing agencies in 2006, and it was critical that the user experience was right. 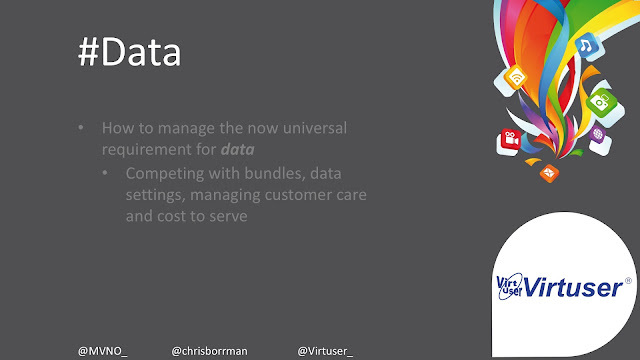 Get the user experience for data for MVNOs wrong and it will be a disaster no matter what the bundle, package or need! You need to get data working in as few clicks possible, and with a uniform as possible experience across all devices to a) keep customers, and b) minimise failures, but most of all c) minimise customer support; which is both a cost and a terrible customer experience in one. you do not want to have the discussion with your MNO at the monthly operational meeting where X% of the MNO's network data hoggers are on your MVNO: just trust me on this one! keep the network, service and price for people prepared to pay for what they use and you are able to allow them to get what they pay for, which keeps the pressure on cost down. nothing is more "cannibalising" to an MNO than points 1. and 2. above! Make the rest of the customer experience easy. An MNO has unlimited bundles that need limiting. 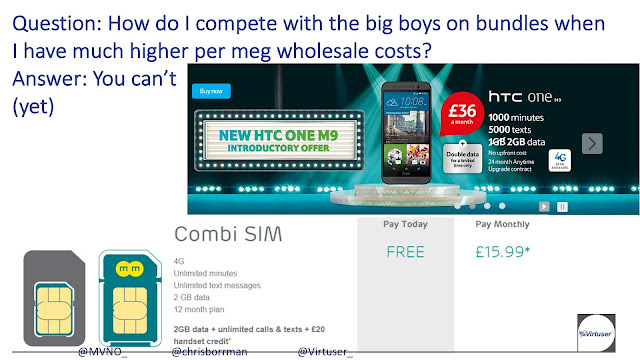 There are however a lot of customers out there that are happy to pay for the data they use, as long as it is not throttled, and MVNOs can often end up with some very lucrative high end users. 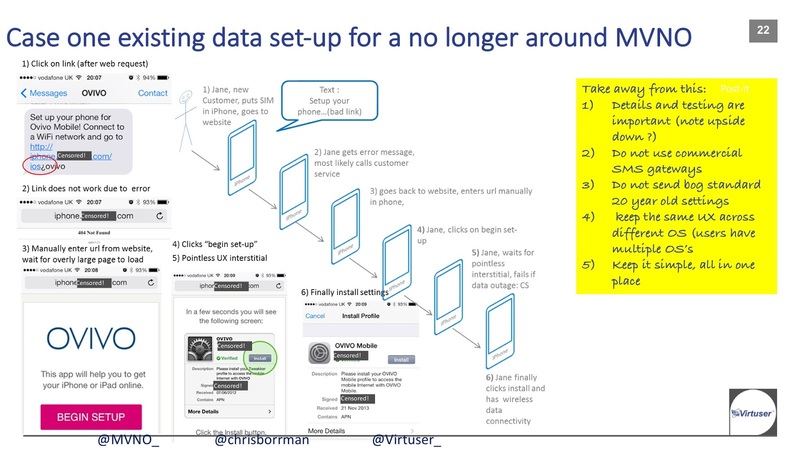 A final addition is the one of eSIMs, which was presented in the 2016 MVNO World Conference the day I chaired this year. 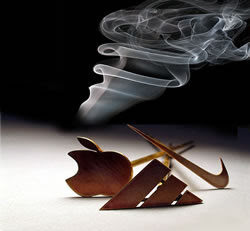 eSIMs are in many devices now, such as iPads and soon rumoured iPhones, and a host of devices coming out soon. You will also need to be able to SIM OTA, which you can do with advanced MVNEs such as the one I built but not many do; which means yet another service to integrate, pay for, another relationship to managed, etc. etc.